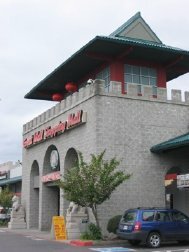 So the Great Wall Shopping Center in Kent, Washington, is one of the better places you'll find near Seattle to buy Asian-type products. The shopping center is a relatively small building with about 10 shops inside, one of them being a good-sized grocery store. There are a couple of bookstores, a video store or two, and some other clothing stores. Last time we were there, we also saw a small toy store, which of course the kids were drawn to immediately. I mean, c'mon, toys? They saw the store before we knew it was even there. It's not a great place, but if you're interested in buying Chinese movies or books, it's a place worth checking out. There are also a couple of restaurants in the shopping mall and around the area as well, so if you're hungry, and in the mood for some ethnic food, it could be a great place to stop. Back from Great Wall Shopping Center.